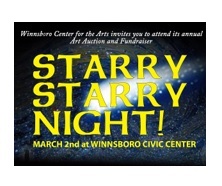 The Winnsboro Center for the Arts is holding their annual fundraiser on March 2. The Centers mission is to integrate the arts into community life by engaging people in the arts through educational programming, cultural experiences and entertainment. The program starts at 6 pm with appetizers and a silent auction. A dinner and live auction from 7 to 10 pm will offer a wide variety of items like rounds of golf, tickets to events and much more. This year the art submitted will not only include 6 X 6 pieces, but new this year will be art pieces donated from well known artists in the area. Tickets can be purchased individually or if you purchase either 6 or 8 tickets a table will be reserved for your party.